Getting Better: It is a matter of life and death. — and to do so faster than everyone else. We often seem to have an over reliance on sports as an example of performance improvement and performance enhancement. 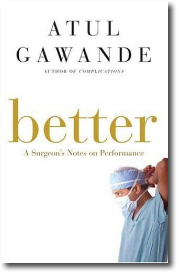 Atul Gawande wrote Better: A Surgeon’s Notes on Performance. This is an exceptional book on getting better and improving performance in life and death situations. I think we in the field of employee engagement and HR must look for performance and engagement models from a variety of sources. This is not a business book but it is a book that could make a big difference in your business. Atul writes exceedingly well, he is a “better” writer as he examines performance with compelling stories ranging from surgical tents to hand washing. My favorite section of the book was on how to become a positive deviant. Here are Atul’s 5 suggetions for how you might make a worthy difference or become a positive deviant. Although the context is medicine I believe the practices would work in any field. Ask an unscripted question. This is a question that makes a connection with another and does not have to deal with the primary purpose you are encountering this person. The unscripted question makes a human and engaged connection with another person. Don’t complain. Resist it. There is often much to complain about but what does it do for you and to you? It’s boring, it doesn’t solve anything, and it will get you down. Count something. Counting something makes you a scientist in this world. Find something meaningful to count. This could range from how many unscripted questions you ask a day to the number of hours you feel fully engaged in your work. It doesn’t matter what you count but the counting should be interesting to you. Write something. You could write a blog post, an article, or even a book. This will sharpen your perception of the world and may offer a contribution to others. Writing may give you new perspective and publishing makes you a member of a community with something meaningful to say. Find an audience even if that audience is small. A small audience can be very significant. Change. Become an early adopter. Look for the opportunity to change. What is the last thing you changed at work or how have you changed your performance? So find something new to try, something to change. Count how often you succeed and how often you fail. Write about it. Ask people what they think. See if you can keep the conversation going. I encourage you to read the book and become the best kind of deviant there is: someone committed to getting better, someone committed to learning and change, someone engaged at the highest levels in their own performance and bringing out the best performance in others.